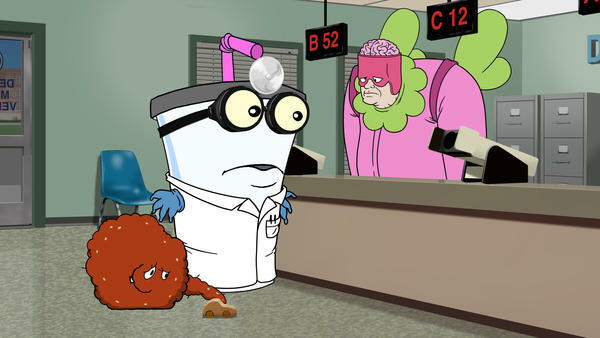 Master Shake (Dana Snyder) attempts to get his driver's license at the DMV in a scene from the final season of ''Aqua Teen Hunger Force Forever'' premiering Sunday at midnight (ET, PT) on Adult Swim. “Aqua Teen Hunger Force” is the longest-running original cartoon on Adult Swim, the decidedly child-unfriendly block of evening programming on the Cartoon Network. “Aqua Teen” is distinguished by its bizarre humor and the fact that its main characters are a talking milkshake, french fries and a wad of meat. The show is in its 11th and final season, and WABE’s Myke Johns sat down with co-creators Matt Maiellaro and Dave Willis to talk about the show’s end and about where it began. So as with this current season, the Hairy Bus … this came from real life? Willis: “We were gonna do an episode where (actor, ‘Robot Chicken’ creator) Seth Green moves in next door to the Aqua Teens. Because he’s gonna play Meatwad in a movie and he wants to start hanging out with Meatwad. And then we were told that we couldn’t ask Seth about it. Or make eye contact with Seth. Willis: “We put 15 years of our career into this show and all our strongest ideas and work, and you’d like to think it’s going to last. Or at least be in reruns for another four more years. I don’t know, maybe it’ll come back. I mean, cartoons don’t ever die. (Actor) Alan Alda gets older, you know? His window to be Hawkeye again is over. The final season of “Aqua Teen Hunger Force Forever” airs Sunday nights at midnight ET/PT on Adult Swim.